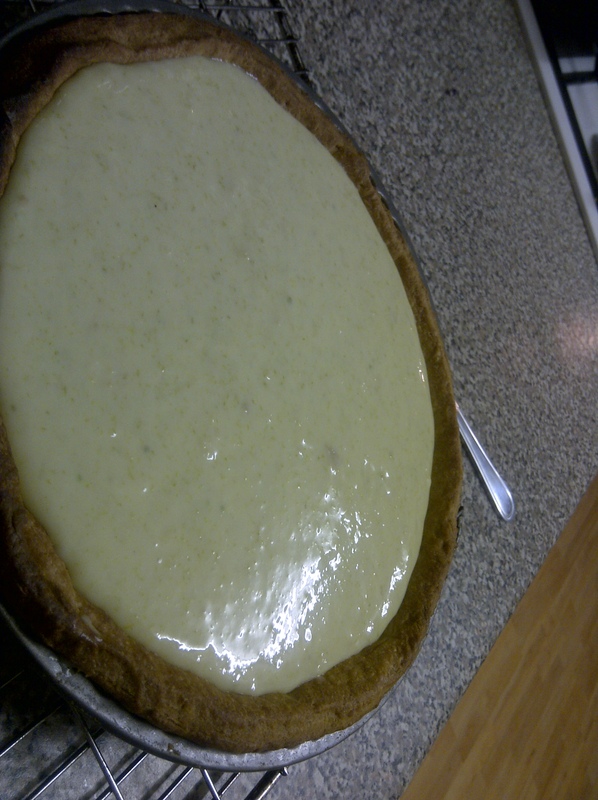 There’s a key lime pie I’ve needed to bake for a while. Honestly, I needed to. It was the one Ryan made on the Great British Bake off, which had Paul Hollywood and Mary Berry in fits of ecstasy. I just needed to know what was so special about it, so I decided to try it for myself. The recipe was on the BBC Food website, and I didn’t really make any changes although I have a couple of teeny alterations that I’d recommend next time. Grease/line a 12 inch tart case. Sift flour, icing sugar, ground ginger and salt into a large mixing bowl. Rub in the cold butter cubes until you get find breadcrumbs. Try not to leave any lumps of butter! Mix the egg yolk into the water and add it to the breadcrumbs. Stir it in with your hands until it all starts to come together to form a dough. If it seems a bit dry, add a tablespoon of olive oil. Wrap the dough in cling film and set it aside in the fridge for 20-30 mins. Just before taking your dough out of the fridge, turn the oven on to 200ºC/gas 6. I actually found this too hot so I’d go for 180º in my oven (I always end up going for a lower temperature in my oven) – just use your judgment based on what you know about your oven. Roll out the dough on a lightly floured surface, to about the thickness of a pound coin. Transfer the pastry to the tart case (best way is by draping it over the rolling pin and CAREFULLY transferring it across, supporting the edges with your hands). Leave the excess pastry hanging over the edges, cover it with clingfilm and pop it back in the fridge for another 20 mins. Cut off the overhang, prick the bottom of the pastry with a fork (DON’T forget to do this, I’ve been there before), line the pastry with baking paper and put in some baking beans (if you don’t have baking beans, coins make a pretty good alternative because they’re heavy and transfer heat well). Bake the pastry blind for 15 mins, take out the paper and baking beans then put it back in for another 5-10 mins. Keep a close eye on it at this point because you don’t want it to burn! Set it aside and let it cool on a rack (don’t take it out of the case). Reduce the oven temp to 170ºC/gas 3 (or whatever you think is about right). In a large mixing bowl, whisk together the condensed milk with the lime juice, lime zest and egg yolds until the mixture thickens (it’s not going to get really thick, just about the consistency of acrylic paint. I’m sure there are better examples of that consistency but my mind’s gone blank, sorry!). Stir in the chopped stem ginger, taste it and ee if it needs any icing sugar. I didn’t put any in mine, and it tasted fine without any – really tangy and gingery. But if you want something a bit sweeter, chuck some icing sugar in! Put the sugar into a saucepan and pour 6 tablespoons of water over it, then put the pan over a medium heat. Don’t stir the mixture, just leave it and bring it to the boil. Remove it from the heat when it’s bubbling and looks a bit solid (the ‘firm ball’ stage).Whilst you’re waiting for it to boil, whisk your egg whites in a mixing bowl to form stiff peaks. Continue to whisk the eggs whilst pouring the boiling syrup onto them. You should end up with a shiny, firm meringue mixture. Place the meringue in a piping bag. Sprinkle the pie with the leftover grated lime zest, then pipe the meringue around the outside in a swirly pattern of your choosing. 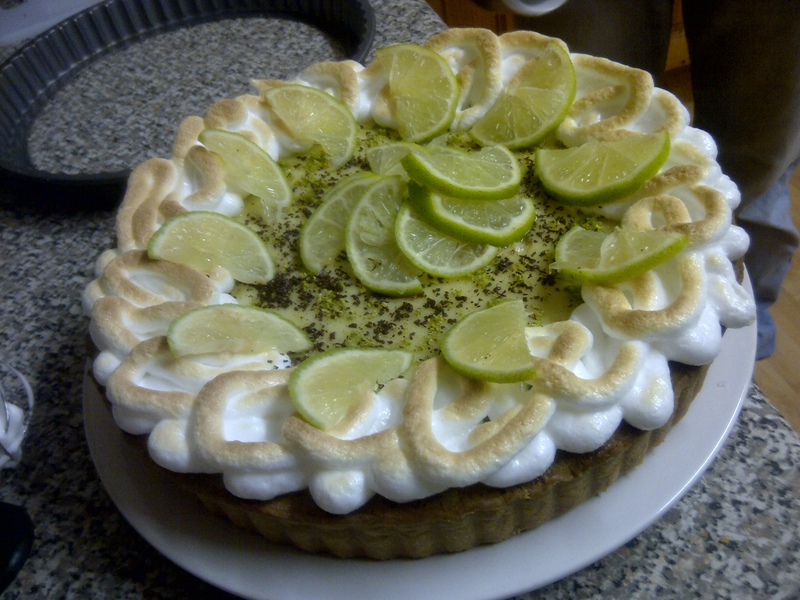 If you have a blowtorch: a) ooooh, fancy; and b) blowtorch around the edge of the meringue. If you don’t, just pop it under the grill and keep a close eye on it. Wait until the meringue goes a gold-brown colour, then remove it. Finally, sprinkle over the chocolate and mint sprigs, and place your lime slices on top. Et viola! After having thoroughly taste-tested it (for research purposes, you understand) I have to say it’s an amazing recipe – very very tasty! 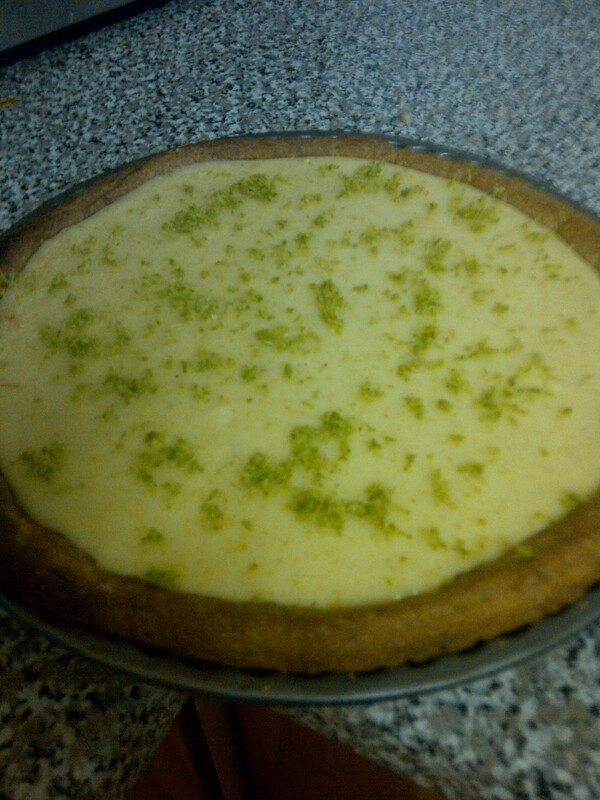 I would thoroughly recommend it, I don’t think I’ll ever be using any other recipe to make key lime pie! It’s really not that difficult a recipe either, so give it a go – you won’t regret it. 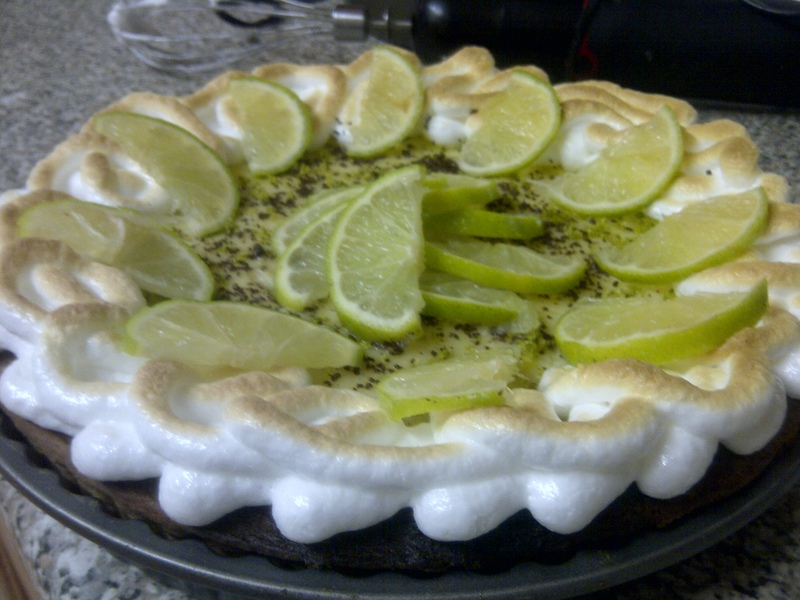 This entry was posted in Cakes and tagged bake-off, baking, lime, pie, recipe. Bookmark the permalink.